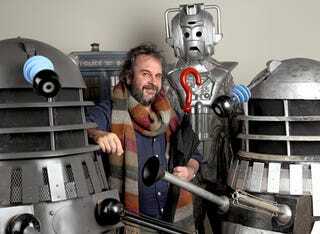 Peter Jackson wants to direct a Doctor Who episode. His fee? One Dalek. Peter Jackson isn't too busy filming the rest of the third Hobbit movie to think about his next career move — and the LOTR mastermind really wants to direct an episode of the time-traveling soap comedy Doctor Who. He doesn't even want any money for it. Jackson tells Entertainment Weekly he's serious about wanting to do this — he even met with showrunner Steven Moffat over Christmas to press his case. The only payment Jackson would want for the gig would be a new golden Dalek, to go with the two screen-used Daleks he already owns (as pictured above.) Jackson tells EW, "They don’t even have to pay me. But I have got my eye on one of those nice new gold-colored Daleks. They must have a spare one (hint, hint)."